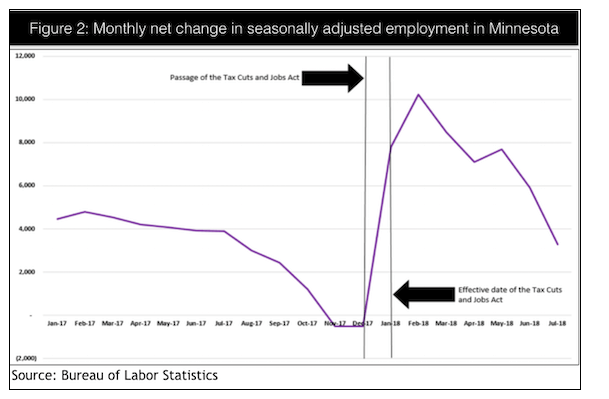 John Hinderaker posted an article at Power Line today about the impact the economic policies of President Trump have had on the State of Minnesota. 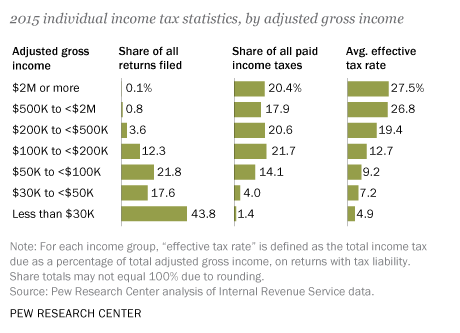 The focus of the article is the economic impact of the tax cuts. …climbed in August by the most since the recession ended in 2009 and hiring rose by more than forecast, keeping the Federal Reserve on track to lift interest rates this month and making another hike in December more likely. 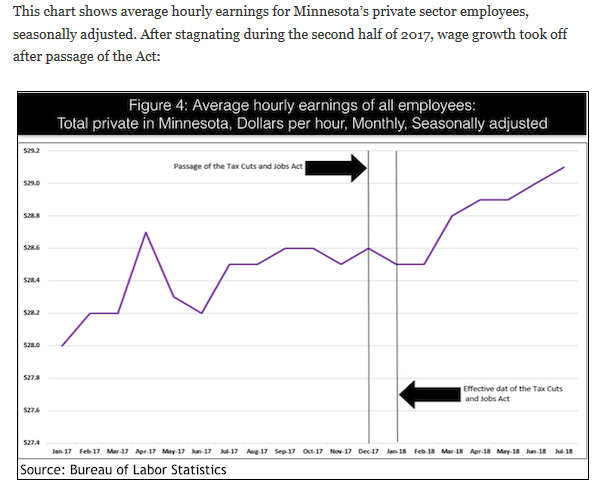 Average hourly earnings for private workers increased 2.9 percent from a year earlier, a Labor Department report showed Friday, exceeding all estimates in a Bloomberg survey and the median projection for 2.7 percent. Nonfarm payrolls rose 201,000 from the prior month, topping the median forecast for 190,000 jobs. As I have previously stated, why is good economic news unexpected during a Republican administration and expected by the media during a Democrat administration? A Democratic Congress never would have passed the Tax Cuts and Jobs Act. In fact, not a single Democrat voted for it. And Hillary Clinton never would have signed it. The progress the U.S. economy has made since Donald Trump took the helm from the hapless Barack Obama is an ongoing rebuke to the Democrats’ anti-growth policies. This is one reason the Democrats are so anxious to regain control over the House in November. With the House in Democrat hands, they won’t be able to repeal the Tax Cuts and Jobs Act, but they will be able to guarantee that no more pro-growth, pro-worker legislation will be enacted. They will focus on impeaching President Trump instead. If you don’t like the current economic growth, vote Democrat and it will stop. CBN News reported today on an unnoticed item in the tax cut bill passed by Congress this year. Churches and non-profit organizations are calling for the repeal of a provision in the GOP’s tax cuts law that would force ministries to file federal tax returns, and in some cases pay taxes. Last winter, as lawmakers touted the tax savings in the Tax Cuts and Jobs Acts, no one mentioned this new federal tax on local churches. But for non-profits like Christian ministries, that little-known provision in the legislation has become a big cause for concern. …Under the new tax plan, churches, hospitals, colleges and other historically tax-exempt groups must pay a 21 percent tax on some benefits they provide their employees, such as parking, transportation and other related benefits. Dan Busby is president of the Evangelical Council for Financial Accountability. He says churches weren’t expecting to get hit with – of all things – an income tax bill, and this one could be a huge burden on groups that have historically enjoyed tax-exempt status. “There are nearly 15 million employees that work in the United States for nonprofits – nearly 10 percent of the workforce – so that’s 15 million parking places. And conservatively, it’s going to cost the non-profit community as a whole up to a billion dollars,” Busby said. That’s a lot of money for ministries that rely on donations. In response to the news, the ECFA put out a petition that churches and nonprofits can sign to protest the employee parking tax. “Tax practitioners who have evaluated Section 512(a) (7) generally believe that the result of this new provision is that tax‐exempt organizations that provide parking to their employees will be subject to unrelated business income tax on the cost of the parking provided. A nonprofit organization that simply allows its employees to park in a parking lot or garage that is part of the organization’s facilities will be subject to a tax on the cost of the parking provided,” the ECFA explained in a position statement available for download on its website. Taxing churches on their staff parking places has to be one of the dumbest ideas I have ever encountered. Guy Benson posted an article at Townhall today about the impact of the Trump Tax Cuts on the American economy. As has been pointed out by anyone with a brain, any deficits in Washington are caused by a spending problem–not by a lack of tax revenue. 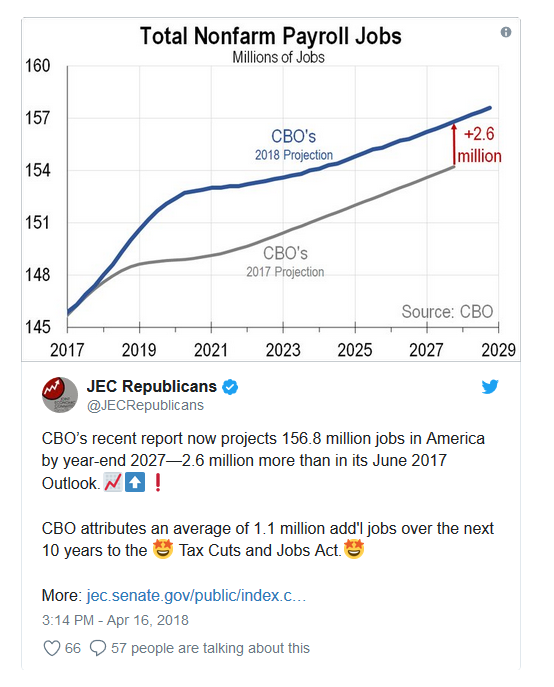 The Congressional Budget Office (CBO) now projects 156.8 million jobs in America by year-end 2027—2.6 million more jobs than in its June 2017 Budget and Economic Outlook. CBO attributes an average of 1.1 million additional jobs over the next 10 years to the recently enacted Tax Cuts and Jobs Act. On April 10, I posted an article detailing the Democrats plan to roll back the tax cuts and increase both personal and corporate taxes. That will bring us back to the slow economic growth we experienced under President Obama. The Republicans need to make sure that the American voters understand that–a vote for a Democratic Congressman is a vote for economic slowdown. Economic policies do have consequences. That has become very obvious in the past year or so.